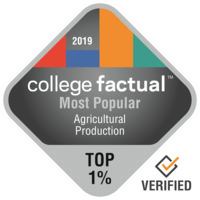 This is a ranking of colleges and universities based solely on the popularity of their Agricultural Production program. Read the methodology here. You may want to commit to an ACT preparation class before you take the exam since the typical ACT score is 28. This college features a high freshman retention rate, with 95.0% of freshman students returning for their second year. Where is California Polytechnic State University - San Luis Obispo doing the best? Look into all the college rankings. 79.0% of freshmen return for their second year. Roughly 31.0% of applicants send ACT scores, with the standard score in the 23 range. Take a deeper dive to check out how well Washington State University ranks in other categories. For those who would like to keep going after earning a undergraduate degree, University of California - Davis has graduate programs available. The campus at University of California - Davis is remarkably diverse and is represented by students from over 36 U.S. states and 47 nations around the world. If you're considering finding out more, you will find every one of University of California - Davis' rankings here. Every student who is interested in Agricultural Production has to look into California State University - Fresno. The location in a big city is wonderful for scholars trying to find adequate prospects for social networking, experience, and discovery. Applicants shouldn't let concerns about affordability prevent them from deciding on California State University - Fresno as 74.0% of students get some sort of school funding. 79.0% of first-year students come back for their sophomore year of school. A virtual tour may be a good way to explore California State University - Fresno. If you're concerned with racking up an excessive amount of college debt, you should be aware that graduates leave University of Hawaii Maui College with about $19,752 in student loans. The student body at this school is very diverse and includes undergraduates from across 9 states and territories and at least 1 countries. Want to know more about University of Hawaii Maui College's campus? Take a virtual tour. In addition to this school being one of the finest institutions in Washington, 2.7% of its undergrads are from out-of-state. YVC College has been ranked one of the best for education quality delivered to veterans and active-duty military. Get all of the essential details on YVC College by viewing their scorecard. Not only is this school one of the finest schools in Washington, 1.4% of its undergrads come from out-of-state. This school is known for its success of military students and is ranked 630 best in the United States for veterans. Go on a virtual tour for more information on Skagit Valley College. Freshman students are not required to live on-campus at Lake Washington Institute of Technology. Since 0.5% of Lake Washington Institute of Technology's population resides outside Washington, you'll have lots of chances to meet students from all over the continent. For more info, check out the college scorecard.